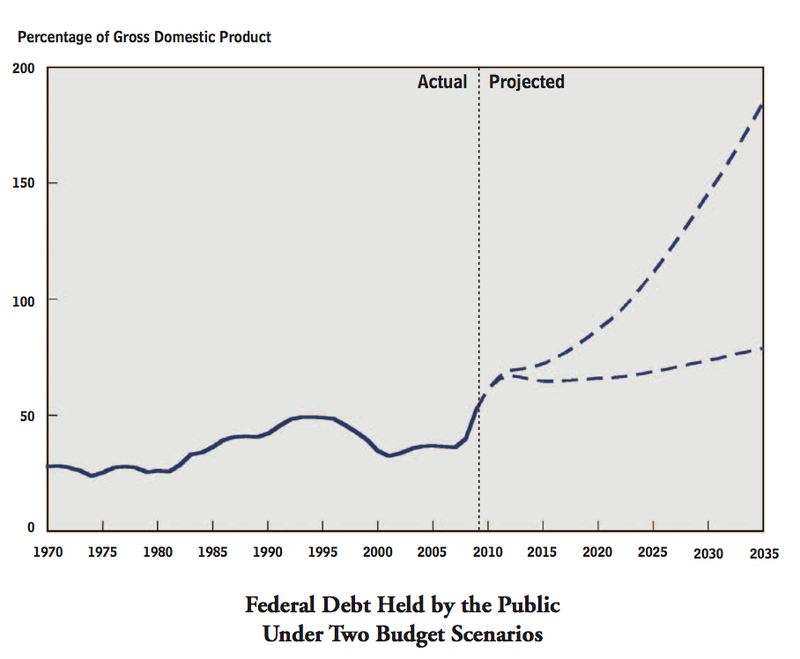 I got to reading Representative Paul Ryan's Path to Prosperity 2012 (PDF) and noticed some disturbing projections in the charts. These charts are from the Congressional Budget Office, which is a non-partisan organization, and I thought the numbers were...well...off the charts. That's a very depressing outlook presented there. The red in the charts makes it more so. It's like he's pulling levers to make flames to instill us with fear and awe. 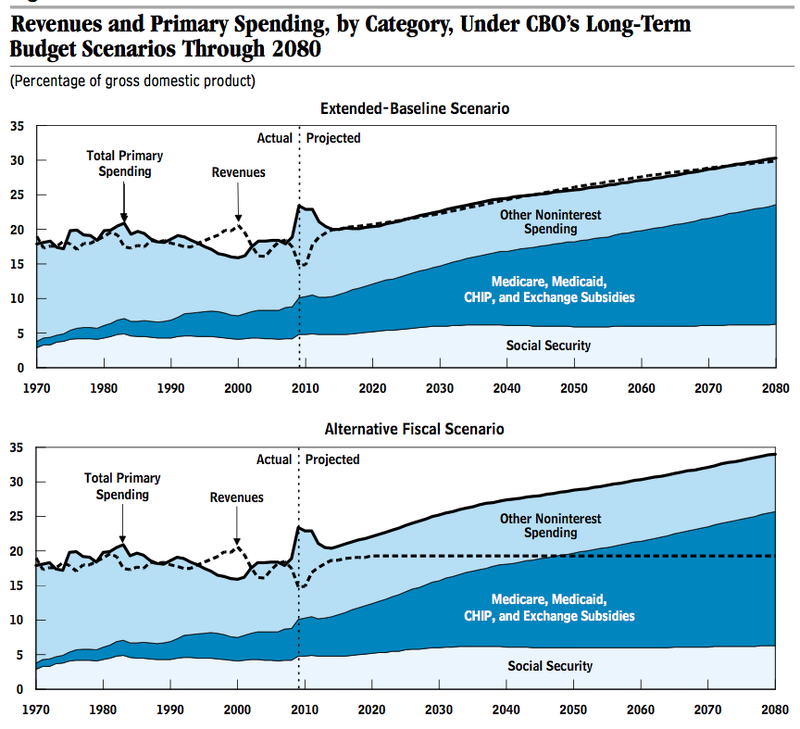 Then I noticed the small print "based on the CBO's alternative fiscal scenario". What the heck is that, I wondered. So I went looking. 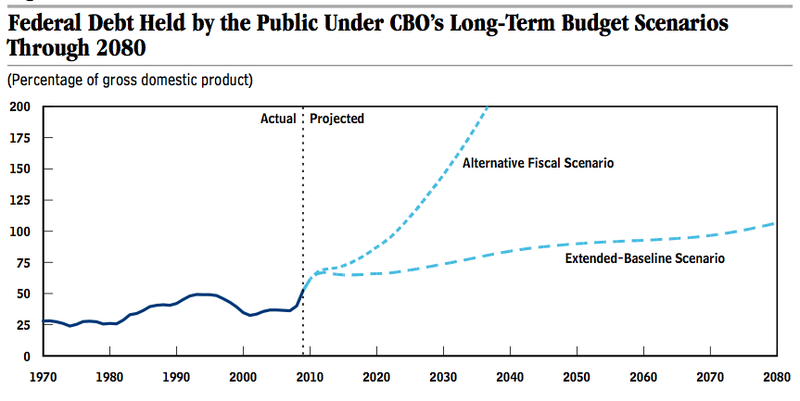 The CBO does a long term budget outlook report and here's the one from last June (PDF), updated in August. 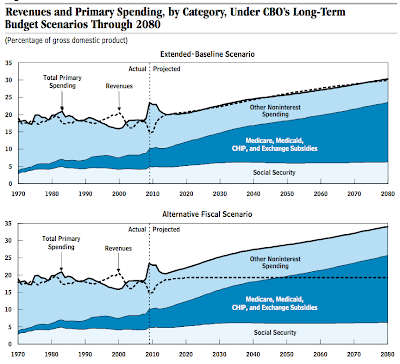 You'll notice there are two budget scenarios in the outlook report. 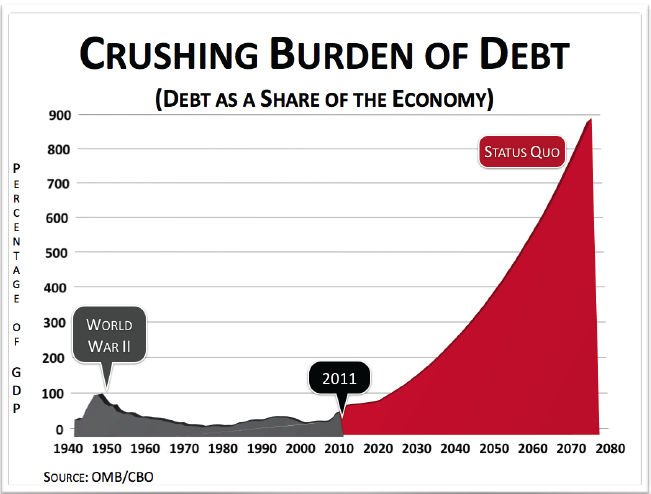 Plus, the scale in this chart is different than the one presented by Rep Ryan. The one he used is at the back of the outlook report. You! Scarecrow, color in the red and stay between the lines! 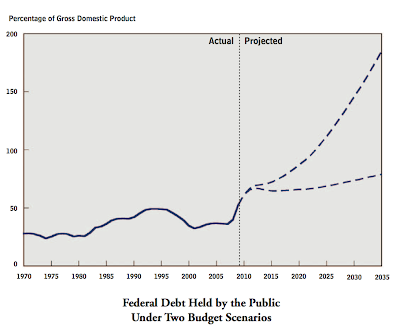 The figure on the cover shows federal debt held by the public under the Congressional Budget Office’s extended-baseline scenario (lower line) and alternative fiscal scenario (upper line). 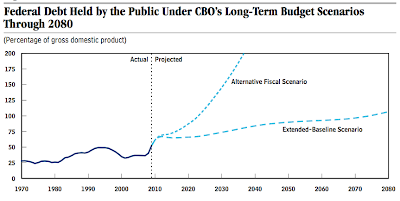 The extended-baseline scenario adheres closely to current law, following CBO’s 10-year base-line budget projections through 2020 (with adjustments for the aforementioned health care legislation) and then extending the baseline concept for the rest of the long-term projection period. The alternative fiscal scenario incorporates several changes to current law that are widely expected to occur or that would modify some provisions of law that might be difficult to sustain for a long period. Essentially the alternative fiscal scenario is based on conjecture. There's more detail later on in the outlook report. The budget outlook is much bleaker under the alternative fiscal scenario, which incorporates several changes to current law that are widely expected to occur or that would modify some provisions of law that might be difficult to sustain for a long period. In this scenario, CBO assumed that Medicare’s payment rates for physicians would gradually increase (which would not happen under current law) and that several policies enacted in the recent health care legislation that would restrain growth in health care spending would not continue in effect after 2020. 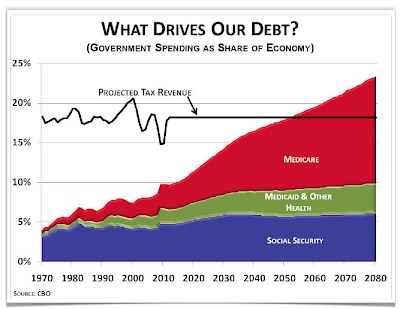 In addition, under the alternative scenario, spending on activities other than the major mandatory health care programs, Social Security, and interest would fall below the average level of the past 40 years relative to GDP, though not as low as under the extended-baseline scenario. More important, CBO assumed for this scenario that most of the provisions of the 2001 and 2003 tax cuts would be extended, that the reach of the alternative minimum tax would be kept close to its historical extent, and that over the longer run, tax law would evolve further so that revenues would remain at about 19 percent of GDP, near their historical average. Rep Ryan is not only selective in choosing the worst case scenario, but also in the parts of the charts he uses. Careful examination of these charts provides an example. OMG, look at all that red. Why, anybody can have a brain. That's a very mediocre commodity. Pay no attention to that man behind the curtain! The great and powerful Ryan has spoken. And when it's all over he'll leave us behind while he floats off in his balloon saying, "I can't come back, I don't know how it works! Good-bye, folks!" I just wanted to make clear that the alternative fiscal scenario includes extending the Bush tax cuts into the future, something the Republican party has pushed for and succeeded in doing, in part, last December. So a huge part of the road to ruin Ryan wants to save us from is of their own making. Hank, while I truly appreciate your perspective, I must wonder where the alternative plan is. Congress is fighting over the current budget - if the Dems were concerned why did they not pass the current budget prior to the election? The president's budget proposal basically punts the entire issue down the road with no solution. I look at Ryan's proposal as a starting point for a discussion that is long, long overdue by both parties. Now let's see what others off and begin the debate. Al, the Democrats have been a total failure in addressing realistic budget issues and coming up with a budget, but Ryan's proposal is deceptive and extreme. 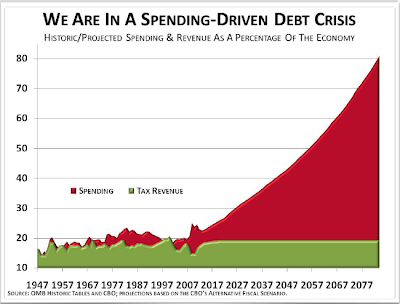 Consequently, as a starting point for discussion is requires Congress to move closer towards extreme and unrealistic fiscal policies in order to appear like they're not going over the edge with the really drastic stuff. Neither party appears to be willing or able to raise taxes to fund the wars we're in. But it's the Republican and Tea Party members who could either (1) care less about Americans, (2) are woefully ignorant of the results of their policies, or (3) serve to enrich the wealthy. The increasing consolidation of wealth to a minority is a great danger to this country. Rhetoric, jingoism and talking points have a much too prominent place in what passes as today's political environment. Print, TV and radio journalism is sadly deficient and in some cases grossly misleading and manipulative. I am surprised every year how much more the millions of (non)working men and women in this country tolerate this.